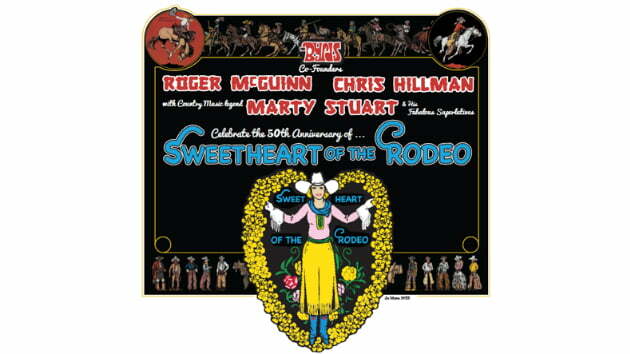 Founding Byrds members Roger McGuinn and Chris Hillman will reunite for a U.S. tour in celebration of the 50th anniversary of their old band’s influential country-rock album, Sweetheart of the Rodeo, which was released in August of 1968. McGuinn and Hillman will be backed on the trek by veteran country singer/guitarist Marty Stuart and his group the Fabulous Superlatives. So far, five dates for the tour have been confirmed, spanning from a July 27 show in Los Angeles through an October 3 concert in Akron, Ohio. Additional performances will be announced soon. In advance of the trek, McGuinn and Hillman will perform a few songs from the album on June 6 at Stuart’s 17th annual Late Night Jam event at Nashville’s famed Ryman Auditorium. Stuart cites Sweetheart of the Rodeo as a huge influence on his own music, and he plays a 1954 Fender Telecaster originally owned by late country-rock guitar great Clarence White, who was a member of The Byrds from 1968 to 1973. Sweetheart of the Rodeo was The Byrds’ sixth album overall and the only one to feature singer/guitarist/songwriter Gram Parsons, who joined the group after the departure of founding member David Crosby. The country-flavored album featured mostly covers, including songs by Bob Dylan, Woody Guthrie, Merle Haggard and The Louvin Brothers. A number of respected Nashville session musicians contributed to the record, including White.